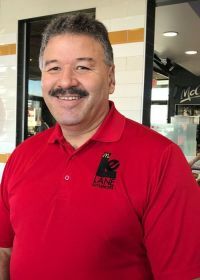 Richard Barela :: Lane Enterprises, Inc.
To talk to Richard Barela amongst his colleagues and supervisors, you can still see the shy 16-year-old that started his career at McDonald’s, but you can also see his love for his job and the people around him. For someone like Richard, success isn’t measured by numbers only, it’s in the number of hugs and handshakes he gives out each and every day. It’s what those handshakes and hugs mean to Richard, his employees, and his customers that helps create a “neighborhood” feeling in each of the restaurants he has helped build for the Lane organization. Today he works at our highest volume store in El Dorado, KS and consistently exceeds our expectations. He develops a team of crew and managers through his exemplary customer service, gracious hospitality, all with an aura of grace and humility. It’s these attributes that have garnered Richard multiple Outstanding Store Manager awards and was a recipient of the Ray Kroc award. Over time, some employees might lose sight of what’s important, but not Richard. His dedication to our organization and to McDonald’s is unyielding. And he doesn’t take all the credit for his restaurants success. Richard consistently takes the time to develop managers and crew members. He is an amazing communicator and his team strives to meet his expectations. He starts by working them on labor, food cost and the profit areas early into their careers and sets goals and rewards their success. He empowers his assistants to staff the restaurant, works closely with the People Manager on hiring and orientating employees. To this day, Richard has many long-term employees and he staffs to give customers the best experience possible while at the same time building sales. Off the clock, Richard volunteers for several community activities, including the Butler County Fitness Jubilee, where he shows kids the benefits of being healthy and fit. He also helps man the information booths at Relay for Life. Richard is no stranger to philanthropy either, he can always be found donating his time or food to local businesses and non-profit groups. To Lane Enterprises, Richard Barela is McDonald’s. When we recruited him all those years ago, we knew he would be a great addition to our team, and today, we’re proud to call him part of our family.